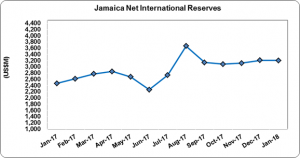 Jamaica’s Net International Reserves (NIR) totaled US$3,203.69 million as at January 2018, reflecting a decrease of US$4.93 million relative to the US$3,208.29 million reported as at the end of December 2017 (see figure 1). Changes in the NIR resulted from an increase in Foreign Assets of US$8.34 million to total US$3,789.51 million compared to the US$3,781.17 million reported for December 2017. ‘Securities’ contributed to most of the increase in Foreign Assets. ‘Securities’ as at January 2018 totaled US$326.24 million reflecting an increase of US$18.78 million compared to US$307.46 million booked as at December 2017. ‘Currency & Deposits’ amounted to US$3,185.07 million; US$16.73 million less than the US$3,201.80 million reported in December 2017. Foreign Liabilities for January 2018 amounted to US$586.15 million compared to the US$572.88 million reported for December 2017. Liabilities to the IMF accounted for 100% of total foreign liabilities, reflecting a US$13.27 million increase month over month from December 2017. At its current value, the NIR is US$733.93 million more than its total of US$2,469.43 million as at the end of January 2017. The current reserve is able to support approximately 40.23 weeks of goods imports or 23.30 weeks of goods and services imports. The country surpassed the benchmark of US$2.54 billion outlined by the International Monetary Fund in the 14th Review and Adjusted Agreement under the Extended Fund Facility (EFF). Jamaica and the IMF have entered into a New Agreement to support growth and create jobs with the international body citing, “Jamaica has made good progress under the previous IMF – support program.” As such the entity has approved a new US$1.64 billion loan for the country. According to the IMF the loan is, “despite the toll of weather swings on growth, Jamaica’s unemployment rate is at 8-year low, with record high employment levels. Inflation is modest, and expectations are anchored in the medium-term target range of 4-6%. Non-borrowed net international reserves remain above the program target, supported by robust tourism inflows and a moderate current account deficit.” As such the Net International Reserve (NIR) target outlined as per the new agreement for the 2017/18 fiscal year is US$3.28 billion (see figure 2 above).